Vivo Mobile provides users with superior audio experience, which is one of the reasons why it has become a major player in the mobile industry. With its prime overall quality, its owners are able to store a huge amount of data in the device, which is not limited to audio files. Data could have been deleted from a Vivo phone due to numerous reasons such as accidental deletion, system crash, factory reset, software update, device malfunction or virus. While the phone owner contemplates the deletion of some files, many cases of data obliteration in Android phones are unplanned. Whether the erasure of the files is intentional or not, it can be rather infuriating when you realized that you need the lost files and you could have spared yourself from the inconvenience if only you backed up your files. There is no use to dread over what has been done. If you are unlucky to have erased data from your phone, you should know the right approach in recovering deleted data from vivo phone. In this article, we can help you recover your deleted files even if you do not have any data backup with the use of a proficient Android data recovery tool. Android Data Recovery is a powerful tool that enables you to recover deleted or lost data with its complete Android compatibility. The recovery process for vivo phone is effortless with the use of this program as well as Samsung, Google, HTC, Motorola, Sony, and LG phones. The program's high recovery rate allows you to get back the files you thought were already lost permanently very quickly. With it, you can recover contacts, messages, audio, documents, WhatsApp, videos, and call history. No matter what the reason is for the data deletion, you can repossess it by using this tool. 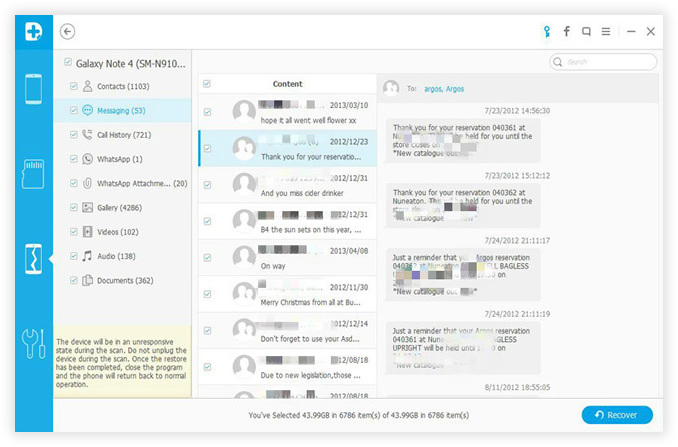 Recoverable Data: Photos, Contacts, SMS, Music, Videos, Call History and Documents. This Android Data Recovery software can work on Windows PC and Mac computer. Just download it according to the computer operating system. Then follow the default setup guide to install it on a computer. Open the program once the installation was finished. In this step, you need to connect the Vivo phone to the same computer with a USB cable. When the device is recognized by the computer, you can proceed to the next step. First, turn on USB debugging on Vivo phone. If you don't know how to do this, please follow this guide. Then connect the phone to computer via USB cable. A minute later, the phone should be recognized by the program. It would take hours to scan the whole device. So it is highly recommended to just select the data you need to recover. Mark the file type checked once needed. The more you select, the slower scanning will be. Click "Next" when selection was done. There are two data recovery modes in this program: Standard Mode and Advanced mode. Please go first with Standard mode as it takes time to recover deleted files. Then click "Start" button to begin the scanning process. It will take a few minutes in this step. Please don't disconnect your phone during scanning. When scanning wad done, the program will display scanned data into different groups. Click the items you wish to recover. Then you have the chance to preview each item in selected category. After selection, click "Recover" button to save the deleted files on the computer. Your peace of mind is highly regarded by the makers of this tool. You can verify the data before you recover it with the preview feature. From here on, when recovering deleted data from Vivo phone, you can decide whether to retrieve all files or just a selected few. Recovery is safe since your existing data will not be overwritten. Plus, there are also other useful features such as SD card recovery or lock screen password reset you can use within this program. 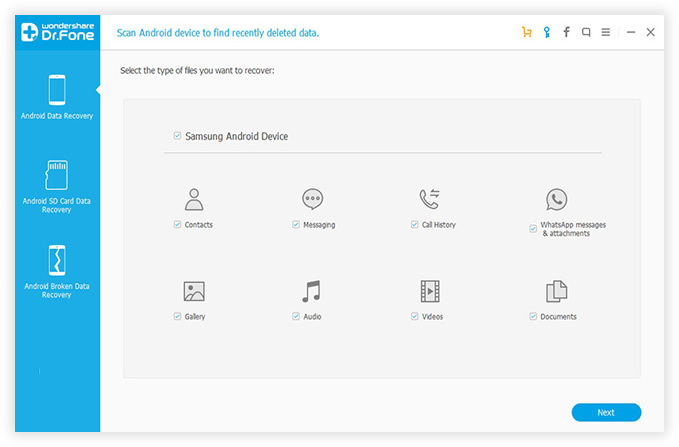 Android Data Recovery is a simple tool that only takes three steps to recover your lost data. Their 30-day free trial is an opportunity that you can use to explore the features, capability and reliability of the tool. If you need to retrieve all of the intentionally deleted data or just some of your lost files, you can use this tool for guaranteed safety and privacy. 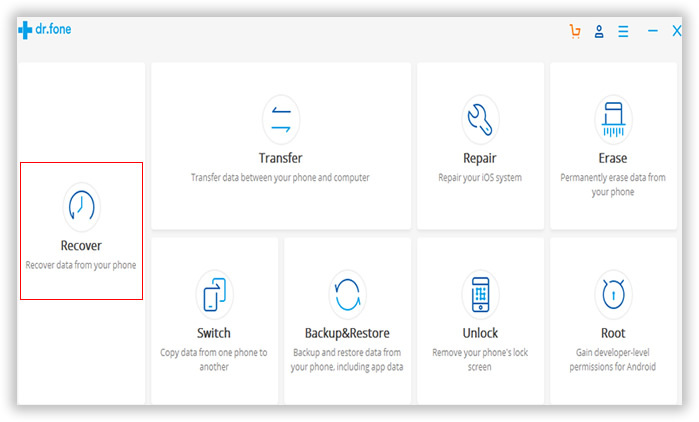 If you have any questions or concerns about this guide on How to recover deleted data from Vivo phone or about the discussed program, do not hesitate to contact us. We will gladly entertain your queries.